The Exchange Backup to PST software is proficient to export Exchange backup mailbox to pst file format. Users are able to convert all the data items like emails, contacts, calendars, notes, tasks and more. The software makes easy for users to utilize their corrupted or damaged data in a proper manner by using the private as well as public store database. With Exchange BKF file to PST converter, bulk conversion is possible. 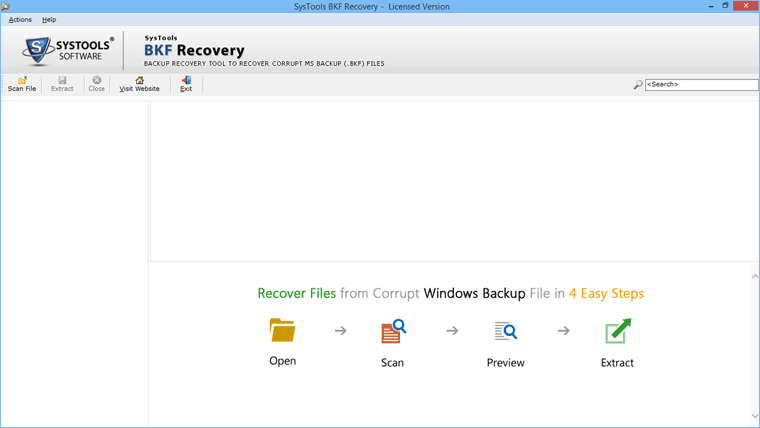 In case, if .bkf file cannot recover with the manual process then, this converter tool can be used to extract multiple Exchange mailboxes data items from corrupt BKF file to PST at once. There is no file size restriction during the migration. 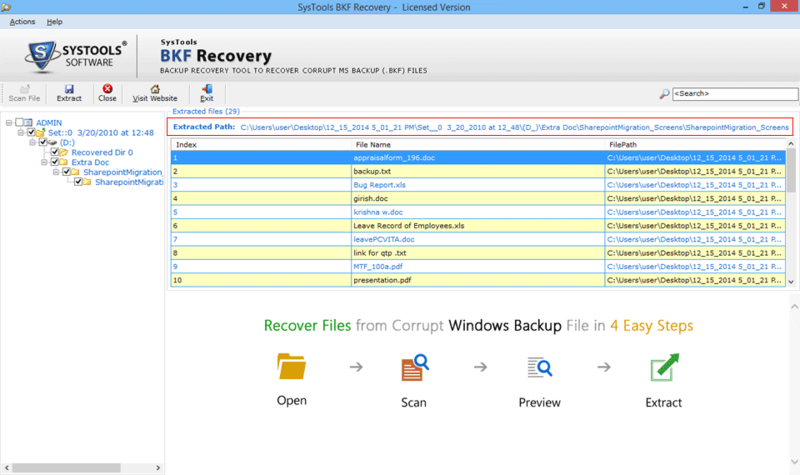 Exchange .bkf file allows to keep the backup of all data items. Hence, if the normal restore process becomes fail then, Exchange BKF converter able to export all items into Outlook PST without data loss. Also, transfer all mails, contacts, tasks, calendars and other files/folders. The Exchange BKF file to PST tool rapidly scans the .bkf file and also creates a preview of all Exchange .edb files. There are a lot of BKF files can be added together at once for scanning and migration as well. After that, a preview of all the extracted bkf files can be obtained. Users can save all the converted Outlook PST file at any specified location on their computer. Even, if they want to create a new folder and save the necessary PST files in it then, they can easily perform by using create a new folder option from the software directly. After migration, the software will generate a progress report. This status report contains each and every detailed information, which can access in future at any time. Moreover, the report will display the conversion status such as complete, in progress and pending data files. Exchange BKF file to PST Utility provides two options to choose the desired option for the type of Exchange database that users need to recover. It makes easy for users to utilize their corrupted or damaged data in proper manner. Q. 1. Does the Exchange Backup to PST tool work on the latest version of Windows Operating system? Yes, the tool is capable to work on Windows machine including the latest edition i.e. Windows 10, 8.1, 7. Q. 2. What is the maximum size of Exchange BKF file that can be converted into PST format? There is no any file size limitation that can be migrated into PST type. Even users can convert 300+ mailboxes at once without data loss. Q. 3. Is the Outlook installation necessary to extract mailboxes from Exchange BKF in PST type? Yes, Microsoft Outlook installation is required with a valid POP3/dummy account on the machine. Step 1 : First of all, launch the Exchange Backup to PST converter tool on the Desktop. 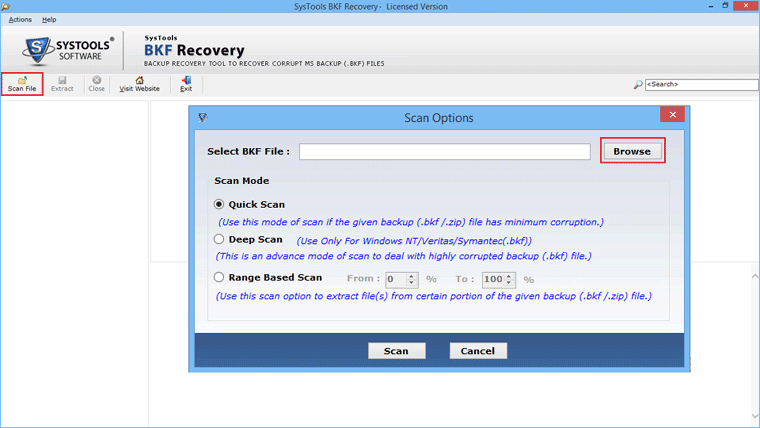 Step 3 : After choosing BKF file, the software starts Scan Exchange .bkf file and view the recovered folders. 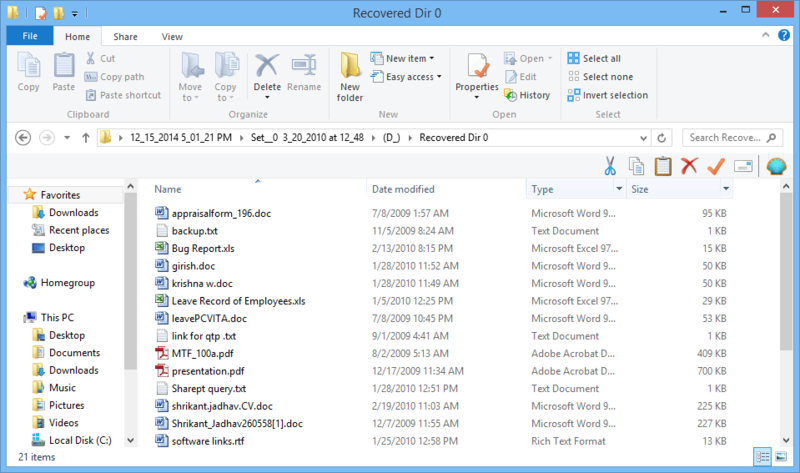 Then, users have to select the folder, which contains EDB file. Step 4 : Now, choose Scan EDB file option. Step 5 : After this, select EDB database type i.e. Mailboxes folder. Step 6 : Next, the software will display all the mailboxes available inside the .edb file. Step 7 : Select User Mailbox and click on it to appear the stored items. 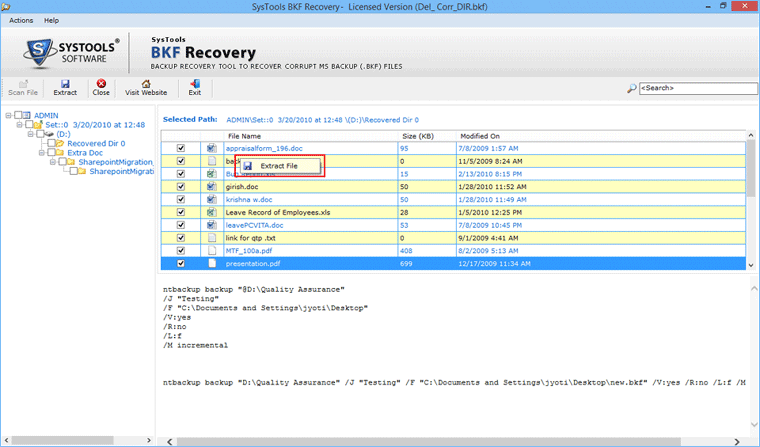 The recovered data will show in the right panel of the tool. Step 8 : After analyzing the content of EDB file, choose Export to PST option. Step 9 : Next, Exchange Backup to PST will display the catalog of User Mailboxes available in the selected .edb file. Choose the mailbox that a user wants to export in PST format and press on Add button. Step 12 : Again, choose the Export button and view the ‘Browser for folder’ box. Now, users have to select the destination location where to save all the .pst files and Press OK button to proceed further. Step 13 : The completion of migration will demonstrate the mailboxes in Completed tab. Step 14 : The completion of mig14. After saving the new .pst file, users will display the final screen. Step 15 : The Exchange BKF file to PST software will create a separate PST file and then, save them in the selected location during conversion procedure. Few month ago I faced a big trouble as my Exchange backup .bkf file was unable to access when Exchange server becomes fail. In that crucial time, I got a reliable tool that helped me first to recover and then, convert all the BKF files into PST type, which is accessible into Outlook PST without any complications. Great efforts!! I am impressed with advanced services of support department of an Organization as they helped me to get back my corrupt Exchange mailbox. I must say Exchange BKF file to PST converter is the best tool that helps me to convert BKF file in Outlook PST format without any kind of loss. Amazing work team. Keep it up! !